Let me confess to an old-fashioned bias: Just as I believe you should be able to put any brand of gasoline in your car, or thread any belt through your pants, I also believe you should be able to put any kind of coffee into your coffee maker. Starting this fall, that won’t be possible if you buy a countertop coffee maker made by Keurig, the Massachusetts-based division of Green Mountain Coffee Roasters. In presentations to investors, the company’s CEO, Brian P. Kelley, has been touting a feature of the forthcoming “Keurig 2.0” brewing systems that will shut out anything other than Keurig-produced K-Cup coffee pods. Picked up a few boxes of discount pods at Costco? You may be driving the kids to school with a splitting headache. “We are a technology company in the beverage business,” Kelley told the audience at a conference in Florida last month. And Keurig is following a path popular with technology companies: using software as a way to lock customers into a particular set of high-margin products. Microsoft, Apple, and the printer-maker Lexmark have all waged legal battles to control their “ecosystems,” which in Lexmark's case has meant trying to keep refurbished ink cartridges out of their printers. It’s rare to see a Massachusetts product attain the kind of dominant market position that Keurig has. And now we’re going to watch as Keurig, which has been the growth engine of Vermont-based Green Mountain, takes the concept of customer lock-in to the kitchen counter. Already, a third-party maker of coffee pods has filed an antitrust lawsuit against Green Mountain. If you’re running a company, it’s easy to see the logic of lock-in: The more products and services you can sell to a customer, the better. So companies use patents, proprietary designs, and software to keep rivals from horning in. There’s often a plausible reason for lock-in. Apple long has said that allowing customers to put any app they wanted on a phone would compromise security and stability, leading to hacking events or crashes. And that’s probably true. But it’s also true that Apple pockets 30 percent of the purchase price every time an app is sold through its marketplace. The company lost a lock-in lawsuit in 2010, when a court found that “jailbreaking” phones to put unauthorized apps on them was not a crime. 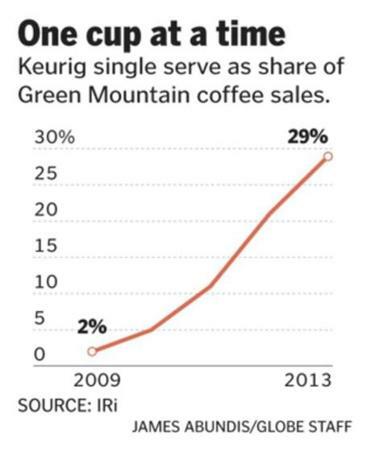 Keurig controlled the entire market for K-Cups until 2012, when its patents on the pod’s design expired. Since then, sales of third-party pods for use in its systems have risen to about 14 percent. One interesting possibility is that Keurig is redesigning its brewers so companies like Starbucks and Dunkin’ Donuts — which today partner with Keurig to make K-Cups — don’t have the option to go rogue when their current agreements are up. Their cups just wouldn’t work with the new brewers. For its part, Keurig contends that the pod identification technology being built into the new brewers has advantages: They will be able to automatically adjust their settings based on the specific pod you’ve inserted, whether it’s coffee, tea, or hot cocoa. (But they will only work with official Keurig K-Cups.) “The brewer and the beverage packs work together to guarantee that when you hit brew, you’ll get the perfect beverage at the perfect temperature — every time,” writes Lynda McKinney, Keurig’s director of public relations, in an e-mail. Lock-in is sort of like the business world’s version of the famous Stanford prison experiment. When you start acting like a warden, you suddenly become much less empathetic to customers, their needs, and the changing market environment outside the walls you’ve erected. And it produces legal bills. Last month, Illinois-based TreeHouse Foods sued Green Mountain, alleging a range of anticompetitive activities, including “redesigning its brewers to lock out competitors’ products,” according to the suit, resulting in higher K-Cup prices, according to the suit. Keurig says the suit is without merit. As it becomes cheaper to put microchips and software into all sorts of products — from coffee makers to your car — courts and consumers will be dealing with lock-in issues much more often. Your toaster could be next. Scott Kirsner can be reached at @pobox.com. Follow him on Twitter @ScottKirsner.